ChessMasters: (Fide Chess World Championship) Magnus Carlsen vs Sergey Karjakin *Game 9* - Mass SP Distribution Game! Join us for another community chess initiative, cast your votes, help distribute SP and make a difference! 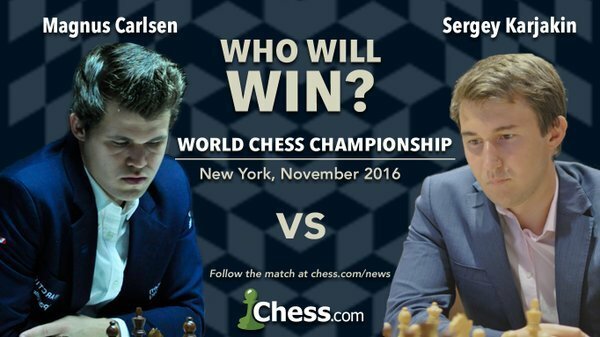 Finally, the World Chess Championship Match 2016 is underway! Through eight games, Magnus has 3.5 and Sergey has 4.5 points! Round 8 of the World Championship match, played yesterday, turned into a dramatic encounter. In what looked like a quite peaceful position Carlsen went on to make a series of risky decisions, pressing hard for a win. Near the end of the game he had a draw in sight by perpetual check, but turned it down, continuing with his risky strategy of playing for a win at all costs. At this point of the game, he was in time trouble, which might be part of the reason for his risky strategy. Or maybe all the complaints about too many draws finally got to him? Whatever the reason, this backfired horribly, and after some accurate moves from Karjakin, he became the victim of a vicious counterattack. As if this was not enough for dramatic effect, Carlsen then sat down for the press conference, but suddenly got upset, and got up and left the room. This is a breach of the contract terms with Fide, and he might be fined for it! There has been quite a storm in the Norwegian press, and he has been branded as a bad loser. This is not going to help his peace of mind facing this very important 9th game of the match, with only four games remaining of the 12 game match. It is anyone's guess what is going on with Magnus at the moment; he seems out of balance somehow, and he is definitely not playing at his best. He has previously shown signs of being vulnerable to media attention, for instance, he plays worse when he is in Norway, where he is treated more like a rock star. Also, I think Karjaki's stubborn defense has frustrated him. 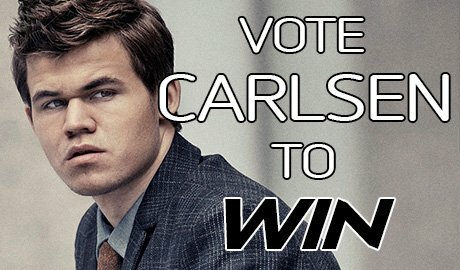 So the question is, what will Carlsen do in Game 9? Will he try to strike back immediately? Or will he follow conventional wisdom in these match situations, to recover with a quick draw? Magnus Carlsen is the Norwegian chess prodigy who became a Grandmaster at the age of 13, the third youngest in chess history! He has been dominating world chess since 2011, when he took first place in the ranking list. In 2013, he became a World Champion, defeating the defending champion Viswanathan and in 2013! Magnus Carlsen is believed by many to be the strongest chess player that has ever lived, and he is known for his superb positional play and endgame mastery. 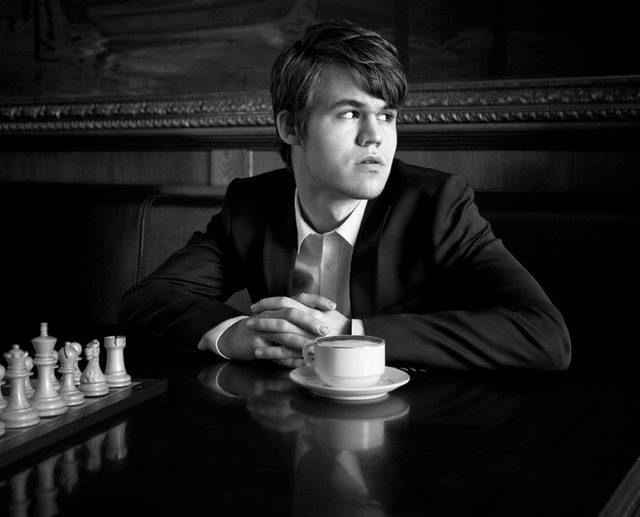 Carlsen typically aims for sidelines in the opening, avoiding opening theory, and instead, aiming to outplay his opponents in the middle and endgame. Magnus Carlsen has an elo rating of 2853. 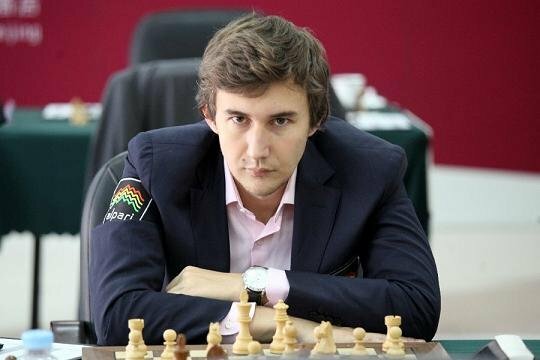 Like Magnus, Sergey Karjakin is also a child prodigy! He was the youngest ever to reach the grandmaster title, at the age of 12 and Karjakin won the candidate's tour in Moscow, and qualified to contend for the world chess crown! Sergey defeated Caruana in the last round of the tournament and finished with a total of 8.5 out of 14, one point ahead of Caruana! Also, Karjakin has an elo rating of 2772. In regards of judging this match, it's important to realize that match play is not the same as tournament play... 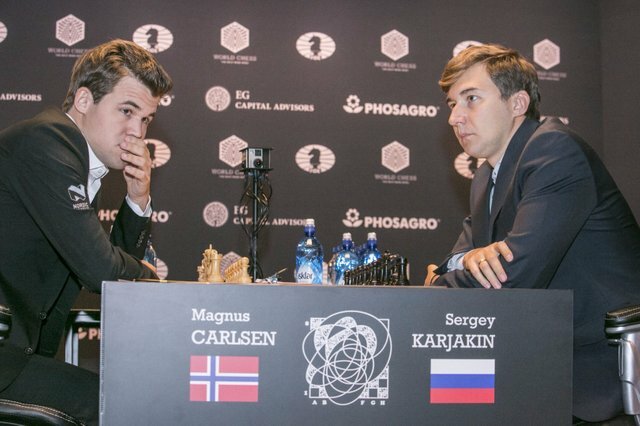 Although Magnus Carlsen is officially the stronger player, and the world's strongest player, World Championship matches are always very tense struggles, where match psychology, preparation, and the strength of the supporting teams around the players plays a huge role in success. The 12-game match is planned to take place between 11–30 November in the renovated Fulton Market Building (formerly Fulton Fish Market) in the South Street Seaport in New York City, with the two contestants competing for a prize fund of at least 1 million euros (US$1.1m). If the score is tied after 12 games, a four-game rapid chess match will be played, then five two-game matches of blitz chess if necessary, and finally, an Armageddon game will be used to break the tie. (Regulations 3.7). Although the comprehensive effect of the venture is yet to be seen, Agon has proclaimed: "The world chess championship in New York will be the first in any sport to be broadcast in 360-degree virtual reality (VR)." Previous comments about the August 2016 Rio Olympics opening ceremony VR experience were mixed. 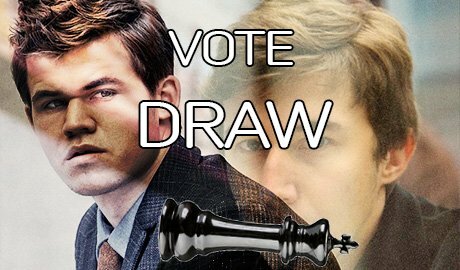 Support ChessMasters Ultimate Vote Betting … together we all can win! Note the views and predictions of the presenters are their own personal views and do not reflect the views and opinions of @chessmasters. @chessmasters does not offer betting advice. Errors and Omissions Excepted (E&OE). ChessMasters is currently in beta, currently no liability will be assumed for errors. @chessmasters reserves the right to amend future payout percentages based on the operation needs of the account. 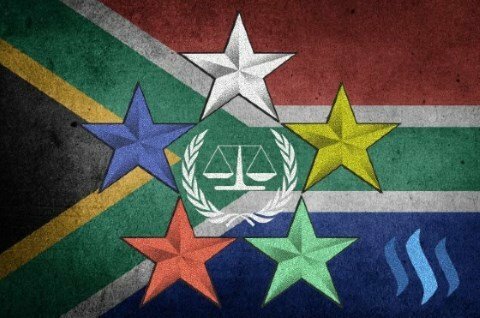 @chessmasters is not a traditional betting platform and no fiat currency is used as rewards or in casting bets; as such does not fall under any gaming and gambling jurisdictions; but even so, users are urged to first consult with the laws and age restrictions of their countries. @chessmasters in the unlikely event that when the Stake Pool is divided up between the winners and the nomenclature resolution goes below the third decimal place (example: 0.0001), then Steem decimal restrictions won’t allow a payout and the pool will carry over to the next game. 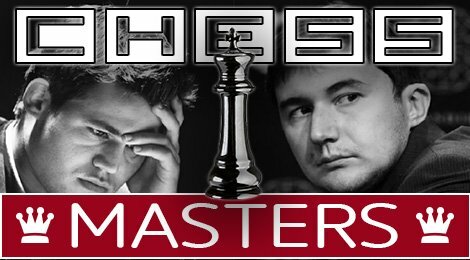 @chessmasters is a @steemsports group initiative. 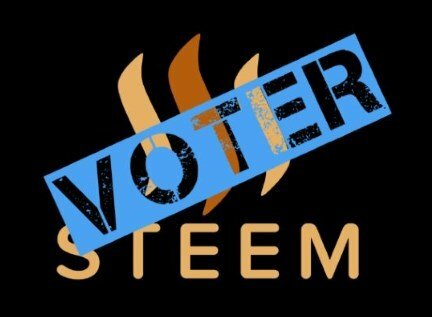 Autovote @chessmasters posts with steemvoter.com and help us grow the SP Distribution Stake Pool! Check out the sports category for great buys! Contact me, thecryptodrive to have your logos displayed in the footer of our posts in exchange for advertising @steemsports and @chessmasters to your communities and initiatives, or for other worthy support. Remember to UPVOTE, FOLLOW REPOST and SHARE on Facebook, Twitter, LinkedIn and others, in support of the @chessmasters initiative! Be aware that votes cast for this post are only for this single game outcome and not for the complete series. 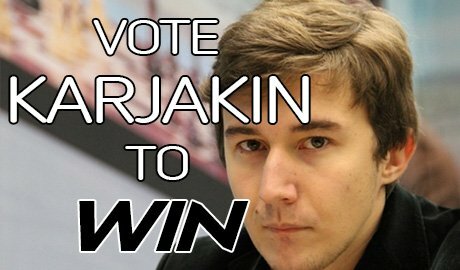 Sergey Karjakin is da man! Did the payouts happen for the previous one? I never got anything. I called Draw. Wasn't it a draw? Edit: I know he won Monday. I'm not sure about the game after that. Wow my bad, sorry. I thought I looked and saw a draw the other day and was wondering. Thanks. You pick draw for this one too? This post has been ranked within the top 50 most undervalued posts in the second half of Nov 22. We estimate that this post is undervalued by $5.28 as compared to a scenario in which every voter had an equal say. See the full rankings and details in The Daily Tribune: Nov 22 - Part II. You can also read about some of our methodology, data analysis and technical details in our initial post. That's it. It's to much. Almost whole trending page belongs to steemsports, and this happening every day. Thanks to that steemit lost an ability to atract new poeple by new attractive content. 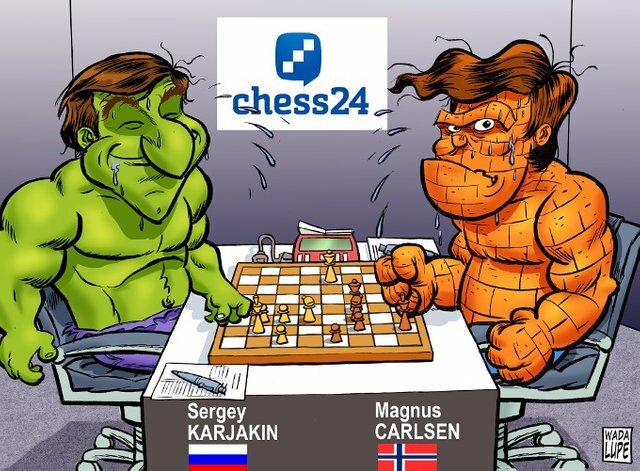 From now on I will flag every post of steemsports and chessmasters. This harms whole community. Shortly I will write a post about that with statistics and more data (of course I will decline whole payout). Noisy, you still continue to downvote our posts even though I tried to reason with you in chat, you are actually being malicious and our team won't stand for it. You are robbing our writers and editors of pay by downvoting and you are creating division in the community. 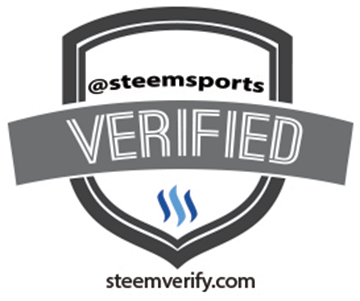 Notice the Steemsports account supports many blogs, the Steem Power is very low because it supports alot of people and so do all my other affiliated accounts. By doing what you are doing you are only trying to get yourself into the limelight, and I am prepared to downvote your comments with all of my accounts in future if you continue to be hostile, downvoting all our posts is not making a statement it's malicious. The rest of the team is welcome to decide whether to do the same. We are actually releasing a charity post very soon to support Holland Rescue for Giving Tuesday, will you be downvoting that as well? And we are planning some Christmas charities as well. 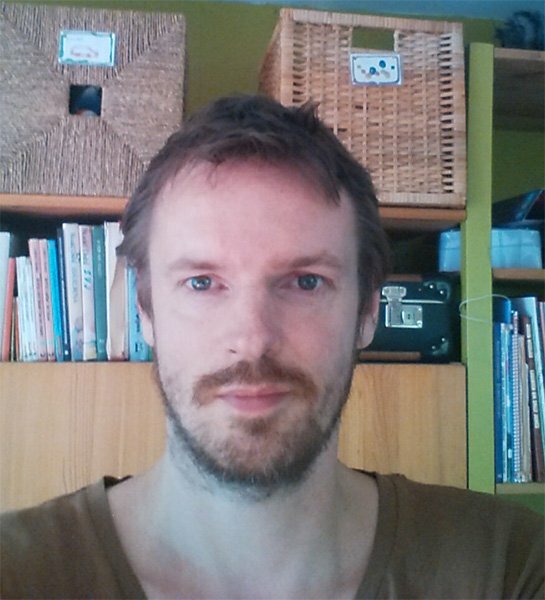 What do you do for the community other than stiffling innovation and anything that is new? You haven't even posted in 3 months. kindly leave us alone as we also wish to leave you alone as well. The fact that the posts are on trending page is a Steemit.com issue, not a @steemsports issue, because there is no content segregation, everything gets dumped on one trending page, how can that be our fault, we are justing trying to grow and innovate. 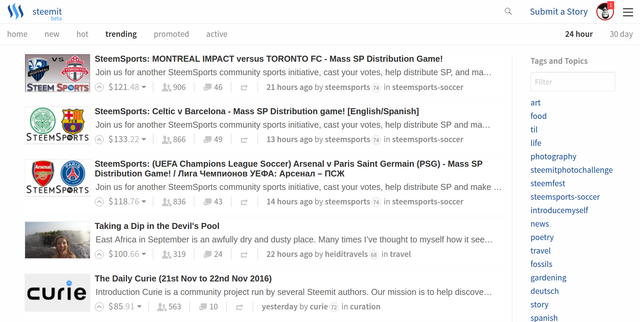 Speak to Steemit.com rather than fighting with us and ask them to have separate Sports and other trending pages, we don't mind being on such a page.